The Ragdoll breed of cat was developed in the 1960s by American breeder Ann Baker and is thought to originate from a cross between a white longhaired cat and a Birman or Burmese cat with Siamese colourpoint markings. The term ‘Ragdoll’ cat derives from their tendency to relax and go limp when picked up. They’re large, but docile and affectionate cats, and an absolute delight to draw. 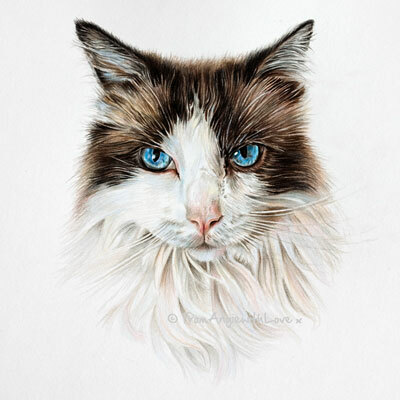 Coloured pencil is the ideal medium for Ragdoll portraits – allowing me to highlight those amazing distinctive blue eyes and sumptuous colourpoint coat. 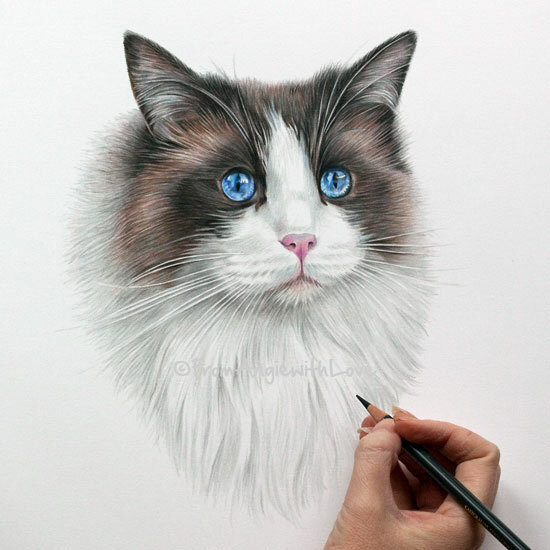 Find out how to commission your Ragdoll Cat portrait here.